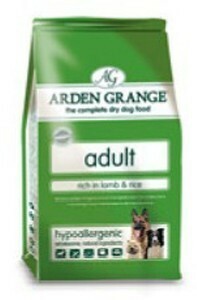 Arden Grange ADULT rich lamb and rice provides wholesome, gentle nutrition for all breeds of adult dogs especially those that may suffer from a dietary intolerance. All Arden Grange products are hypoallergenic and free from wheat gluten, dairy products, beef and soya. They contain no artificial colourings, flavourings or preservatives. Feeding Arden Grange reduces the risk of dietary intolerances and allergies that can cause digestive disorders and skin complaints. Feeding recommendations: Arden Grange ADULT with lamb and rice is suitable for all adult dogs. Ingredients: Lamb Meal* (min 30%), Whole Grain Rice (min 26%), Whole Grain Maize, Chicken Fat, Beet Pulp, Dried Brewers Yeast, Egg Powder, Fish Meal, Linseed, Fish Oil*, Minerals, Vitamins, Nucleotides, Prebiotic FOS, Prebiotic MOS, Cranberry Extract, Chondroitin Sulphate, Glucosamine Sulphate, MSM, Yucca Extract. * Preserved with mixed tocopherols and rosemary extract.